We are a leading Manufacturer of cookies cutting machine, mechanical cookies machine and plc cookies machine from Coimbatore, India. 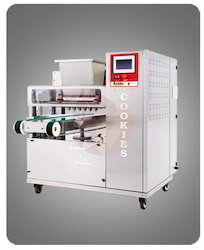 Since we have developed our base in this competitive market, we are readily engrossed in presenting an inclusive assortment of Cookies Cutting Machine. Produce cookies of different shapes and sizes from simple wire cut design to dropping varieties of nearly 30 types. * Production speed may vary according to the product design. With the touch of a buttorn you can get the machine running to the programmed design. additional plc makes it easier for storing program for later retrieval.